See where consumers shopped, dined, and discovered on Small Business SaturdayWhere did you make your favorite purchase of the day?Which type of small businesses do you most associate with your local community?Which type of small businesses do you wish there were more of in your local community? 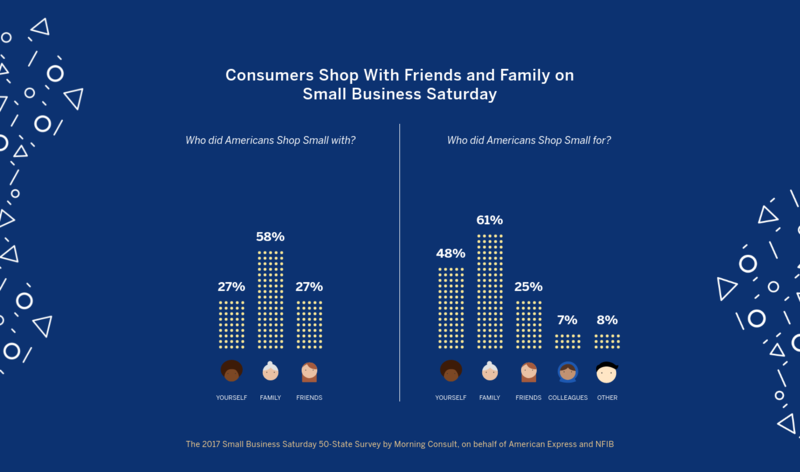 Who did Americans Shop Small with? Who did Americans Shop Small for? 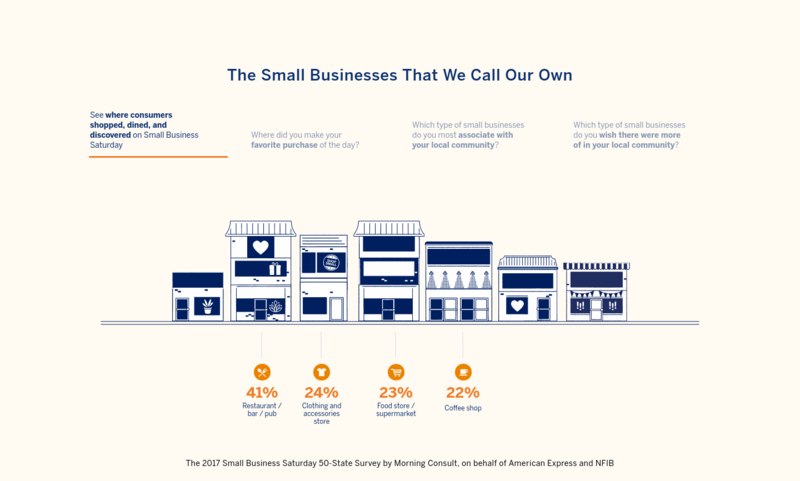 November 25th is the eighth annual Small Business Saturday. 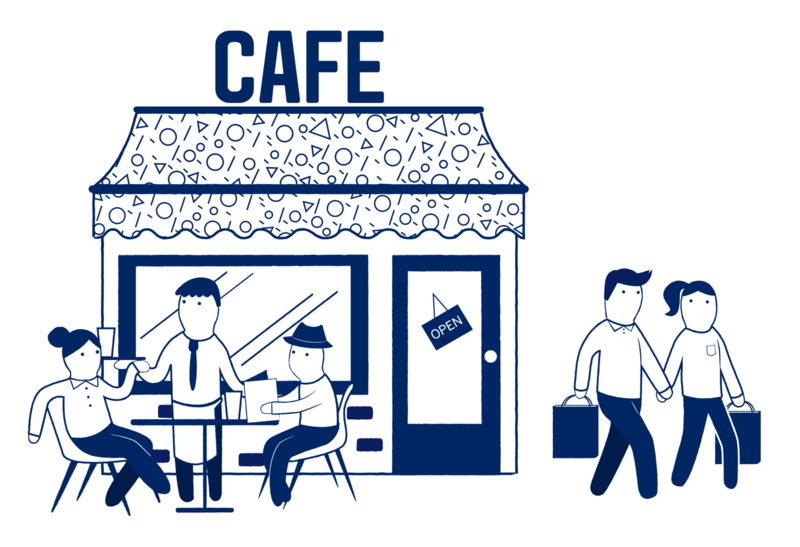 Dedicated to supporting the diverse range of local businesses that create jobs, boost the economy, and enhance neighborhoods around the country, Small Business Saturday was created by American Express in 2010 in response to small business owners' most pressing need: getting more customers. 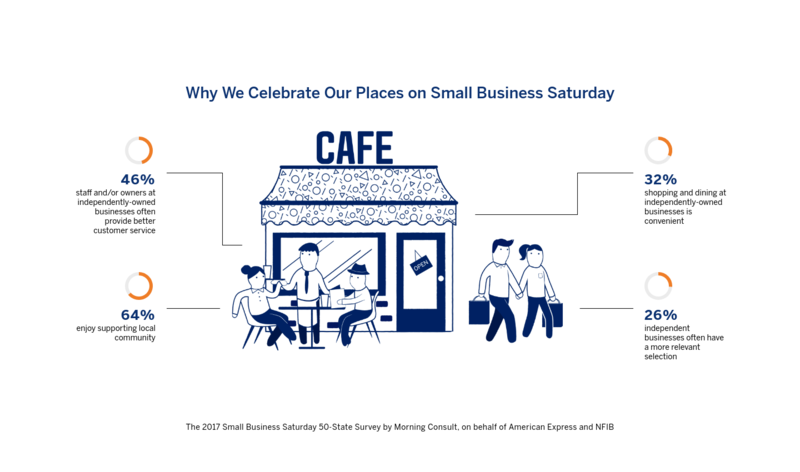 Morning Consult, on behalf of American Express and the National Federation of Independent Businesses (NFIB), from November 25th - 26th, conducted the 2017 Small Business Saturday 50-State Survey, among a national sample of 10,063 Americans aware of Small Business Saturday. The data cited are estimates based on self-reported data from this survey and do not reflect actual receipts or sales. Morning Consult used a statistical technique called multilevel regression and poststratification (MRP) to construct state-level estimates from the national survey data. The state level estimates were weighted to approximate a target state level sample based on age, gender, and education. The interviews were conducted online in English, results from the national survey have a margin of error of plus or minus 1 percentage point, and the state-level margins of error vary by state (typically 2 percentage points to 5 percentage points).